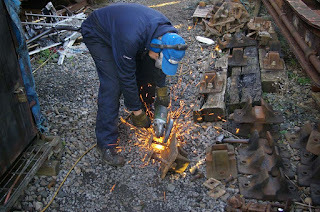 Really, there was only Bruce working on the loco today. Gil was in for the morning, but seemed to mainly do paperwork (signing off work done, I think). Then there were two FLA meetings (probably one for the trustees and the other was their AGM, I believe). Anyway, the interesting thing was Bruce's discovery. For a long time, drivers have complained about their difficulty in maintaining vacuum in the reservoir. Even this last week, they could only hold 21 inHg, whereas the reservoir should hold 23 inHg and the train pipe 25 inHg. The vacuum pump has often had the blame, and been stripped, cleaned and twiddled with; the rubber seal within the vacuum cylinder was also blamed, and we had the cylinder out, cleaned, new seal, etc. ; the vacuum relief valve (commonly known as the pepper pot) was blamed, claiming it was relieving itself at 21 instead of 23. Bruce has previously had it off and set it to 23. Today he removed it again and checked it - it is still set perfectly at 23 inHg. However, what he noticed was that the cover part (that gives it its name "pepper pot") came into contact with the central spindle of the valve internals. When the top was screwed on tight, it appears that the spindle was being depressed by about 150 thou'. Therefore, vacuum was being lost continually! ... or continuously, whichever you like. So, no wonder the driver couldn't maintain 23; no wonder the pump couldn't maintain 23. So, Bruce filed off a few thou' on the top of the central spindle (you can see that there was ample exposed thread to do that) and re-fitted it. Sunday will be the test! 1) The tender steam heating relief valve blows off at 40 psi. This is a strange complaint, since (a) it has been specifically set to blow at 40 psi; (b) the railway told us to do it at 40 psi, and (c) Carriage & Wagon told us not to exceed 40 psi because of the frailty of some of the hoses on the coaching stock! Perhaps someone should tell the driver??? 2) The RHS cylinder valve spindle packing is blowing steam. This is not a big problem to re-pack it. 3) The bolts on the running board retaining the two large stays from the smokebox are loose. We are aware that these ought to be fitted bolts (and currently they are not). However, being round-headed bolts, we can't currently tighten them! :-) So, we'll get the holes drilled and bolts made to fit ... in due course. 4) Some bolts on the running board are loose. I was told of those on the RHS last week, and I fixed two of them; the third could not be tightened - the mole grips could not hold the (round) head firmly enough to be able to tighten the nut. It certainly won't come loose! No one told me there were some on the LHS, too! Anyway, rain thwarted much play. I was painting rail chairs (would you believe). The Flag & Whistle has sold three, to date this year; the Coffee Pot (at Winchcombe) has sold none so far. She is in service on Sunday 17th (which is either tomorrow, today or a few days ago, depending when you read this email). She is then in service on Friday 22nd for Fire & Drive; followed by service trains on Saturday 23rd and Sunday 24th. There is no loco roster beyond that.